I had just finished with my enlistment papers in August of 1976 in preparation for entering the Navy by the end of September. I had been out of high school for 4 years at this point and was cognizant of the need to find a new direction out of Brooklyn, and the sea seemed to be the most likely route of escape for me. I was working at H and A Foods on Kings Highway at the time. It was just after lunch when the first news of what had happened in Korea came over the radio. 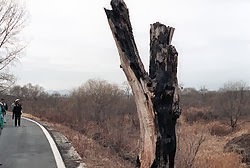 The way I remember the story; and have always told it; was that 5 American Captains had entered the demilitarized zone between North and South Korea to trim a tree which was blocking the UN Observation post’s view of the zone from the Southern side. 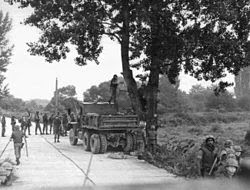 The tree trimming was supposed to be done on a rotating basis between the two sides, which have been at war since 1950. No armistice has ever been signed. When the Captains and their men reached the disputed tree they were attacked by North Koreans who used the axes to kill the Americans and the South Koreans. The United States re-acted by placing 40,000 troops on high alert while scrambling fighter jets and B-52’s to circle the demilitarized zone while the Army Corp of Engineers went out with a bulldozer and ripped the tree up entirely by its roots. It was one of President Ford’s finest hours; maybe his only one; but yet I could not even find reference to it in his own autobiography! Having a good memory can be infuriating, as I have wanted to write about this piece of history for several years, but wanted to check my facts first. But there was nowhere to turn for information until this article appeared on the website Environmental Hippie. I have no idea why it was posted there. Notice that I didn’t get too much wrong. It was apparently only 2 American Captains that were killed by the North Koreans and I did not know that the tree was planted by the late Kim Il Sung, was the leader of North Korea at the time. The article also states that there were 8,000 troops on alert, a figure I am willing to dispute as there were 40,000 American troops in Korea at the time, and you can bet that they were all on alert. In addition, the tree was not ripped up as I thought by a bulldozer. Rather it was sawn off at stump level while our planes circled overhead and the North Koreans stood impotently by. A few years after the incident, a plaque honoring the 2 fallen officers was placed on the stump in their honor. There is no point to this story other than I want to set the record straight about the Panmunjom Incident; particularly that it did, indeed, happen. History is precious and needs to be preserved. Well, that may just be the point of this whole post. The Earl Scruggs Center - Shelby, N.C.
NAFTA - Who Started It?